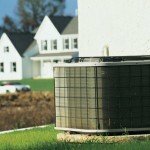 Are There HFCs in Your Air Conditioning System? 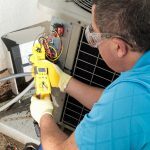 If you have a central air conditioning system in your home, chances are good that the refrigerant used includes a man-made chemical substance known as HFCs (hydrofluorocarbons). These odorless, colorless gases have been positively linked to serious environmental problems such as global warming, leading the European Union to ban HFCs in 2011. Here’s what you need to know about HFC’s and their negative effect on the environment. HFCs are man-made fluorinated gases that are composed of a combination of chemical elements including fluorine, carbon and hydrogen. Hydrofluorocarbons were initially developed as a replacement for substances that were known to cause permanent damage to the Earth’s ozone layer, namely CFCs (chlorofluorcarbons). When HFCs were first introduced in the 1990s, they were viewed as a safe alternative to CFCs for use in numerous applications such as refrigerants in cooling systems and propellants for products in aerosol cans such as spray paint and underarm deodorant. This led to the widespread use of HFCs throughout the world by industries ranging from automotive makers to food product manufacturers, while governments moved to ban the ozone-depleting CFCs. Unfortunately, researchers soon discovered that while HFCs did not cause serious problems for the ozone layer like CFCs did, there were significant environmental problems related to the use of HFCs. Scientists learned that these new, highly stable fluorinated gases negatively interacted with existing greenhouse gases, creating a super-warming effect that speeds up global warming at an alarming rate. As a result, HFCs have been nicknamed “super” greenhouse gases and “climate forcers” by many environmentalists and activists in an effort to highlight the extreme effect hydrofluorocarbons have on accelerating the changes in the global climate. According to a report by the UN, the “warming potential per molecule of HFC is 11,700 times more powerful than carbon dioxide”. The report goes on to explain that if HFC use continues at the current rate, they could soon surpass carbon dioxide as the compound that has the greatest negative impact on global warming. Once scientists sounded the alarm about the effects of HFCs on the environment, governments throughout the world began to develop protocols and timelines to eradicate the use of these harmful substances, beginning with the “Montreal Protocol” in 2007. Under this international agreement, 196 countries agreed to phase out their use of HFCs slowly, eliminating them altogether by 2050. New refrigerants that do not pose a known threat to the environment or contribute to climate change are now available for use by both air conditioning system manufacturers and as after-market replacements for HFCs in existing central air conditioning systems. These new substances are now being used throughout Europe in automobiles, homes and commercial buildings. To learn more about your particular air conditioning system and to find out if it contains HFCs, contact a And Services today.